Good to be back. Well, my dears. I'm working on my fourth case. I'm either "pampered to death" or "nursing a grudge" - I can't tell. This time around I'm investigating the suspicious death of gentleman connected to San Francisco's hottest restaurant critic. It's getting a bit hairy, but hey, I'm getting a little better at this investigation thing. Now, on the mommy front - things are still scary - is she supposed to eat the baby food carton along with the baby food? I think I better run. 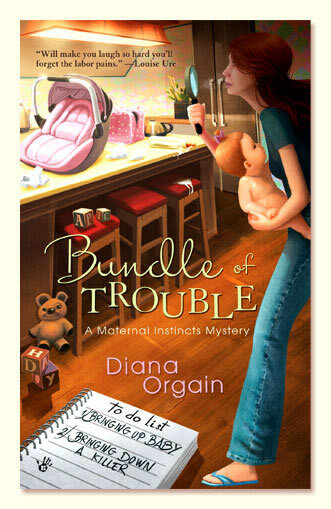 For fun - and back by popular demand - is chapter 2 of my first book (and my first case) Bundle of Trouble - just click on the link and enjoy. If you didn't get a chance to listen to chapter 1 - I'll put that below too! I think eating the container applies only with puppies. I read your current three in this series and can not wait for the forth to arrive. When is the 'due date' for the 4th one? Due date, BusyMom? I hope you heard my loud groan! Bet you feel like a juggler balancing eight plates on sticks. I'm so glad to hear that you're working on your fourth case. Looking forward to reading it. LOL! Duedate indeed - I'm targeting a Christmas release - will definately keep you posted. Thank you for the support! This series sounds great! thanks for the links!